I have finally got around to flying my PKD Buster II 2m. 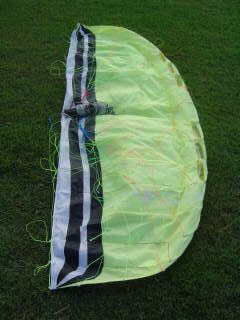 I bought the kite second hand off eBay before going on holidays to the beach. I had grand plans of spending some hours flying kites on the sand, but sadly children and visiting relatives got in the way. Yesterday I got the chance to scoot down to my local park to put the Buster II up for an hour. According to the Bureau of Meteorology, Brisbane was experiencing wind of 14 knots (26 km/h) gusting to 22 knots (41 km/h) at the time. Who knows what the wind was at my local park, but it seems about right. Bought off eBay, the Buster II still had sand on the kite and in the lines from the previous owner’s last use — ohh, and the lines were twisted. It took me a good 10 minutes to sort out the four lines. The Buster II launched easily. Initial impressions are that it is slower than my Prism Stylus P3. The Buster II also had a tendency to overfly and then collapse, falling to the ground in a tangle of lines. Time to do the walk of shame … again. The Buster II gave me a lot more confidence to fly in the power zone than the Prism P3. After a little practice, with the four line set up I knew that I could de-power any time I liked. The four lines were also useful to stop the Buster II over flying. At the zenith, I could pull back on the brake lines to drag the trailing edge as well as reducing the efficiency of the kite, meaning that it does not over fly. I also managed to reverse the kite into the air after crashing leading edge first into the ground. Cool!